After weeks of planning our 1st Annual Easter Egg Hunt and Potluck (I know I need to have a second to make it the first annual) went off without a hitch. The kids had so much fun, the parents enjoyed a little adult conversation, we got to catch up with some old friend, and the weather couldn't have been better after snow just five days before. 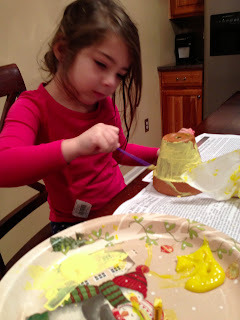 Not knowing if the weather would be nice enough to keep the kids outside for very long I had a few easy and toddler-friendly Easter crafts planned. Everyone loved them and they were perfect for all the kids who ranged in age from 1-5 years old. 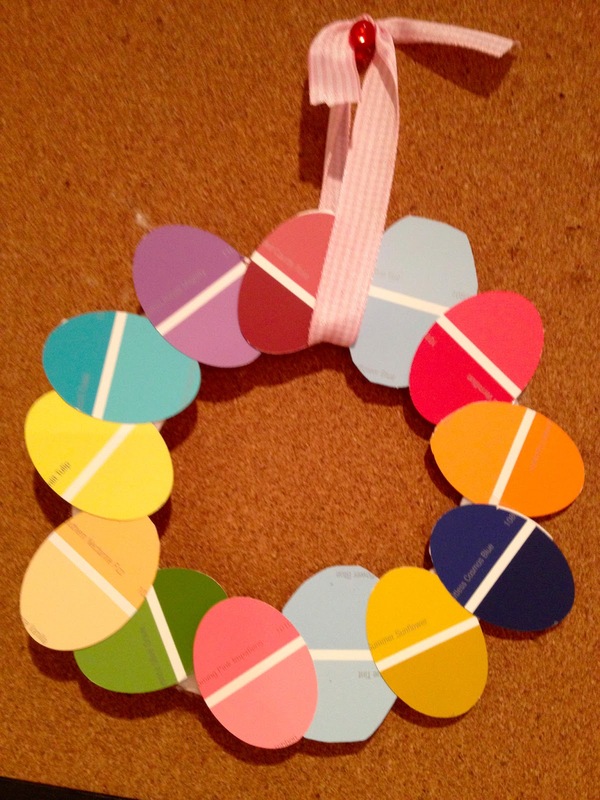 My favorite -- and it was a crowd pleaser, as well -- were the paint sample Easter egg wreath. I have a little paper shape cutter set that I used to cut out all the eggs. I then cut out the center of styrofoam plates for the back of the wreath. The kids used glue sticks to glue the various colored eggs on. I had some ribbons pre-cut that they could use to tie around their wreaths so they can hang them. Cute, right?! We also did bunny masks -- again with styrofoam plates. They kids glued cotton balls, pom poms, and black pipe cleaners on the plates to make bunnies. I had pre-baked sugar cookies and cut out rice crispy treats in Easter shapes (bunnies, bunny heads, butterflies, and mini flowers) for decorating. I bought several different colors of icing that could easily be squeezed onto the cookies. They decorated them with way too much icing and some festive sprinkles. 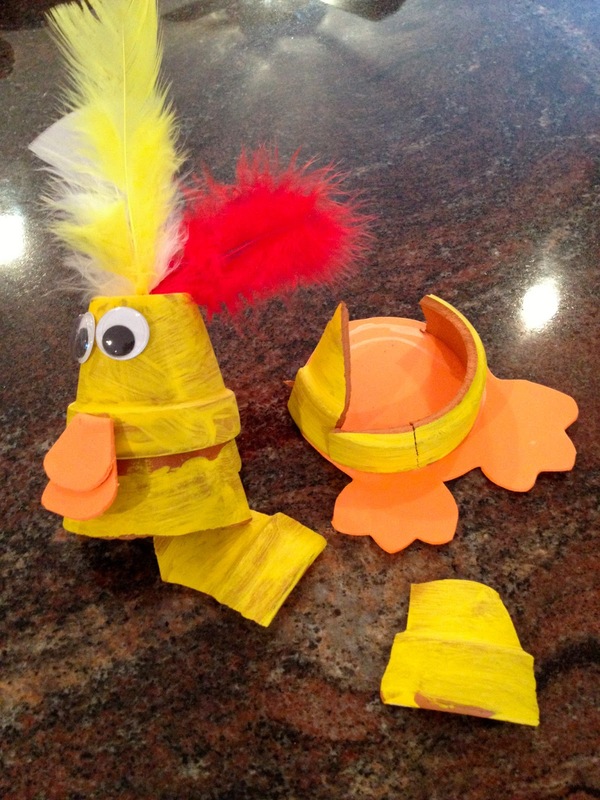 We didn't make "Chuck" (is it a chicken or a duck?) at the party, but my 4 year old and I did make it at home, after my son chucked it (maybe that's where the name originates) on the floor leaving his sister devastated. To stop the tears, we replicated Chuck by getting two new clay pots. My daughter painted them yellow (the Crayola washable finger paint we tried to use didn't work on the pots, so we switched to an acrylic paint and had better luck) then added the feathers, googly eyes, and orange foam beak and feet. So as you can see, with a little imagination there are lots of cute Easter crafts for kids of all ages!